Our unparalleled attention-to-detail surrounding the finishing touches enables you to achieve decorative honesty with a personal flair. the finishing touches—pull together any interior design project while showcasing more of your personal style. Often overlooked, this integral part of the project ensures success down to the smallest component. Angela Neel Interiors team pays close attention to the details for every type of project, including both formal & casual settings. We arrange and place Art & Accessories to add the perfect touch to your space. We draw from dozens of lines, from Local to National, and International origin, to ensure a unique look and feel. Why is it so important to add art & accessories into your project? Quite simply, the flow and mood of the room is greatly affected by them. They are a great way to lend a distinct personality that is tailored to each client. These small details often make a room come together and give a project the finishing touches it needs. We also work with local artists to commission one of a kind pieces for our clients who are looking for a one of a kind piece. At Angela Neel Interiors, we know just how important the details are, which is why we offer only the finest brands of accessories for all of our clients. Take a moment to come into our Winter Park showroom today to look through the array of Art & Accessory lines we carry. Our staff is happy to answer your questions and help bring your vision to fruition. 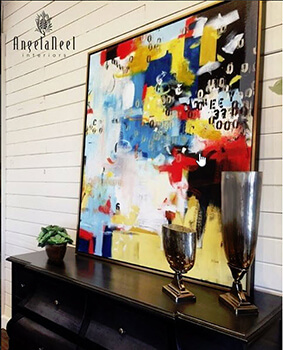 With over 25 years of experience, Angela Neel Interiors is the perfect place to obtain all of the pieces needed to complete the look and feel of your design project. Visit our store today to get started.